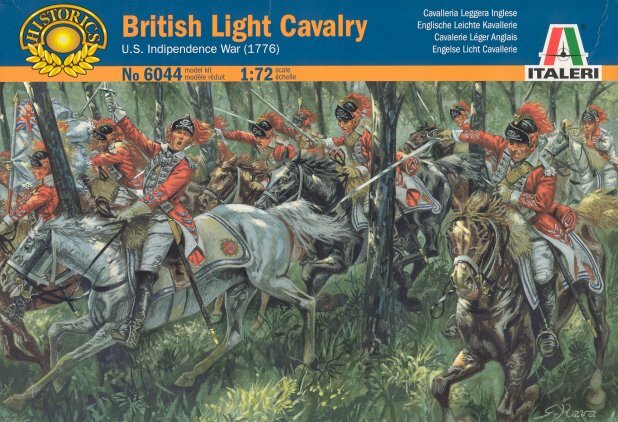 Welcome to another Italeri review, this time the British Light Cavalry, representing the 17th regiment (with the insignia of Death or Glory). A lively and interesting box, with the cavalry immersed in a formidable charge through a forest, although it is not the best place to charge it makes for a good artwork. This is Italeri, a big and powerful company (well, so big and powerful as a model kit & miniature can get!) and there is absolutely no flash (or I have been very lucky, or I have yet to see flash in a Italeri set). The horses are very well done, very dynamic, some of the best horses I've seen. They have also poses that are not exactly the same as always, which is very welcome. The figures have very sharp detail, even if they have the typical problem of oversized heads. The poses are active and quite realistic, except the man with the sword (the only figure you get 2 of.) that is really doing nothing, like just speaking with a companion. The rest are really doing something and not in the same poses as always. Besides this, we get plenty of men using their fire-arms. This is probably what I like the most of this set besides their quantity and unique figures, as always having the cavalry just with swords and all their fire-arms kept in their holsters is boring, and cries for modification, and transforming a sword-holding pose into a fire-arms pose is sometimes very difficult. If they've had smaller heads, this would be nearly a 10. There are some minor flaws,but I am not a enthusiast of this era, and really I don't care if a holster was on the left or on the right, or if I can hardly distinguish the sash. The biggest flaw is the standard bearer, who shouldn't carry a flag, but a guidon, which can be easily fixed. Besides cutting the logo in their hats, to make another regiment, you can hardly make anything else. You would need to cut their hats at least, and all the same the jacket is very distinctive, so if you buy them, they'll have to be what they are. This figures are quite "alive" (as alive as can be a miniature!) with 5 unique men, which is great and very uncommon from Italeri. They are nearly all active, and the man down with the horse trying to get up is a fun addition. Sometimes you think that just Napoleonic and similar eras can't be fun sets, as the brands tends to always make the same poses, with same numbers, with zero imagination, but this a truly different set. Here we have leader, musician, standard bearer, and even captain or sub-commander, which is simply perfect. We have also plenty of men with fire-arms, so you will be able to make something like two regiments, and the quantity is good, 17 figures. Just the wounded man will be unsuitable, but knowing that normally you get 12 men, that is just not losing a bonus. So a full and nice 10 for these men. 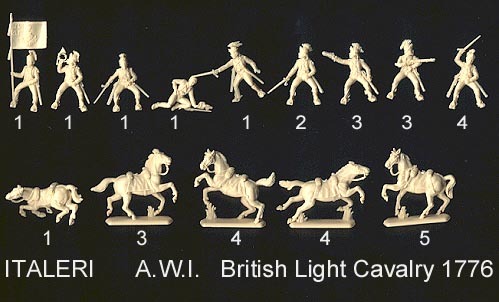 8 GBP, which is the cheapest eBay price, is very good for 17 cavalrymen. And you can easily spot it in retail shops, so even if you are not a super-enthusiast of this period, you will be attracted to buy it.